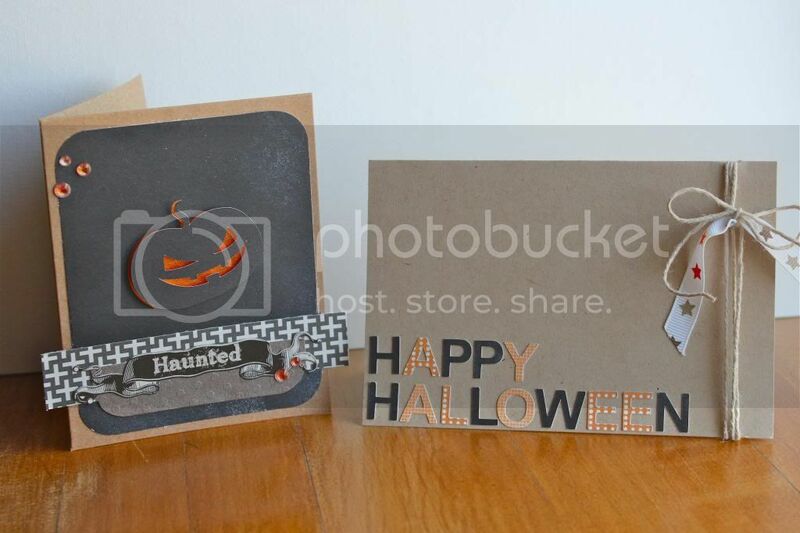 Stephanie Gold Designs - Page 86 of 92 - A card making & crafting blog. Hello all! I am still recovering from what feels like the longest cold of all time but I managed to sneak into the craft for a bit of cardmaking. 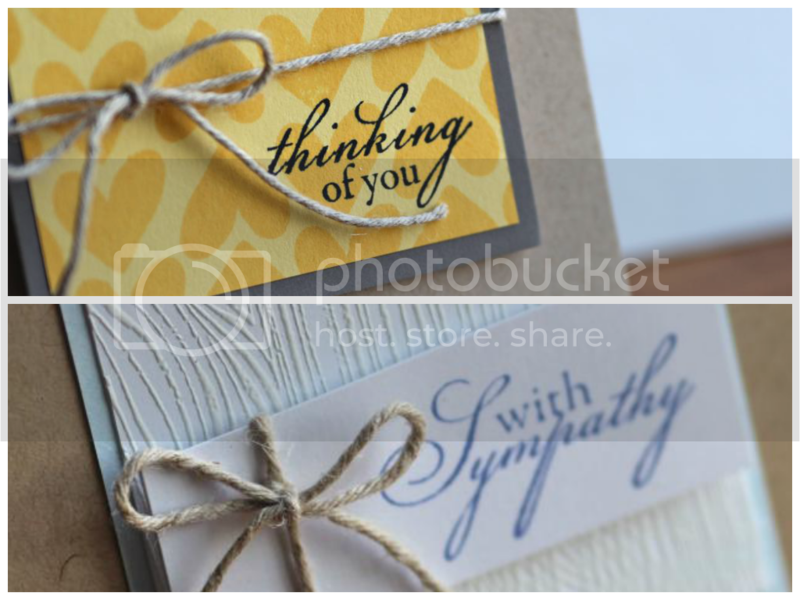 So today I have a couple of sympathy cards to share with you. Let’s get started! 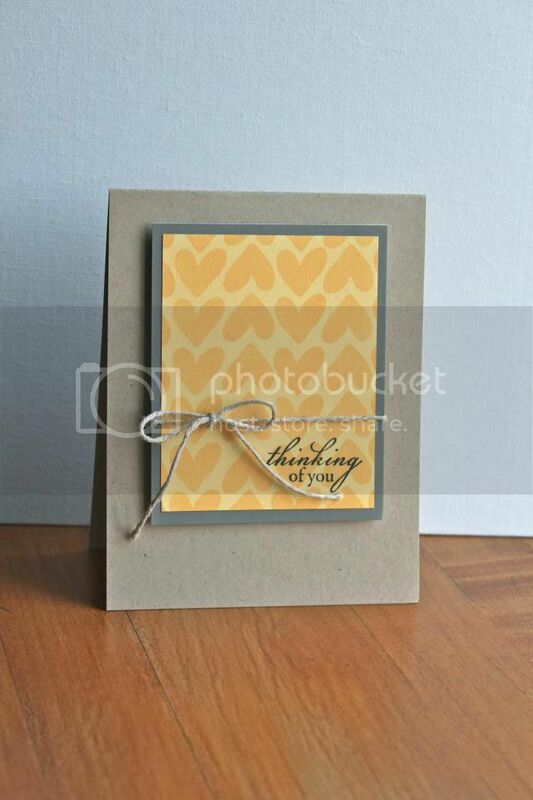 For this card I made a pattern paper out of yellow cardstock and a heart stamp and stamped the sentiment on top with black ink. I kept things simple with a piece of grey cardstock underneath and attached it to the PTI kraft cardstock with dimensional adhesive. 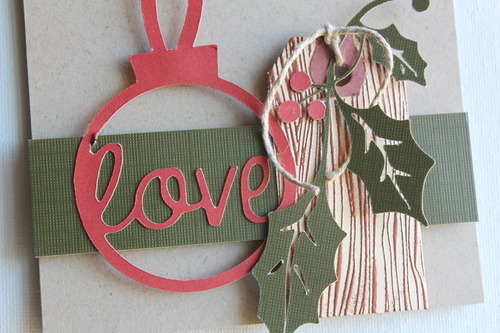 I finished the card off with a wrap and a bow of hemp twine. For this next card I went for more of a masculine feel using blues as accent colors. 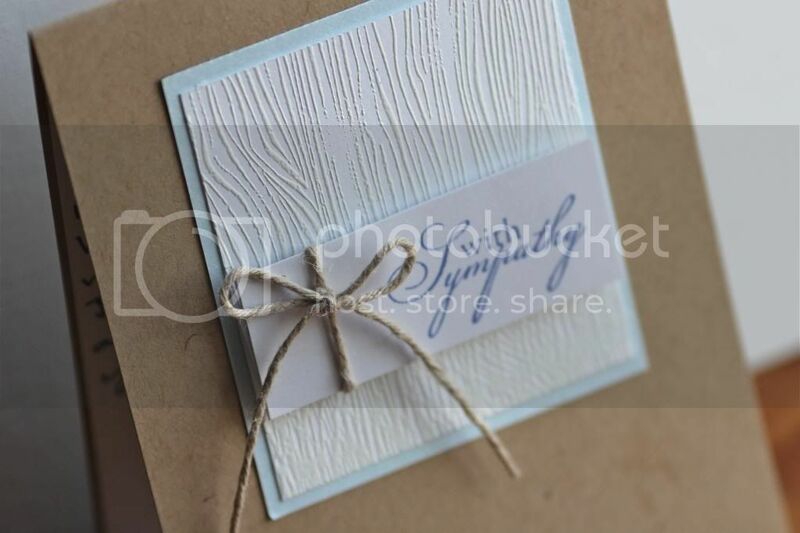 I started this card by embossing the woodgrain with white embossing powder on white cardstock. 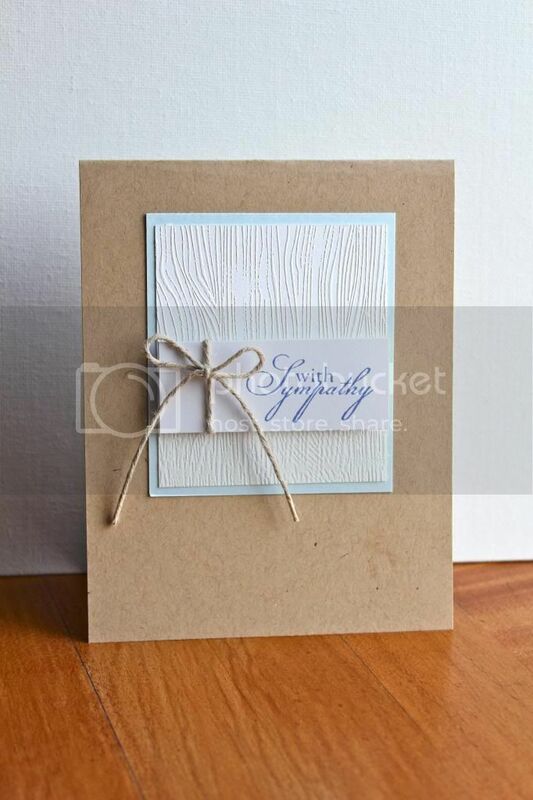 Then I adhered it to the light blue cardstock and attached that to the PTI kraft cardstock. I stamped the sentiment in a darker blue ink on another piece of white cardstock and attached that on top of the woodgrain with dimensional adhesive. 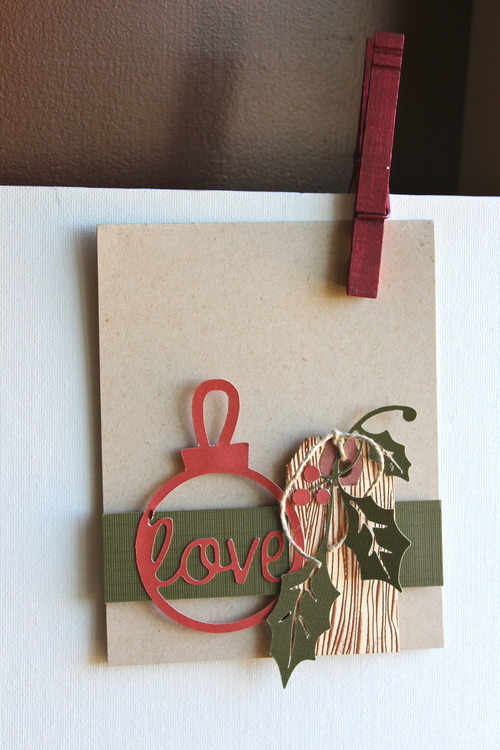 I finished the simple card off with a small bow in hemp twine. Thanks for joining me today and happy creating! My oh my!! I have been suffering from one heck of a sinus infection for a couple weeks now. 🙁 Sorry I missed last week and I will be back as soon as I can! In the meantime, have fun crafting up some beautiful cards! 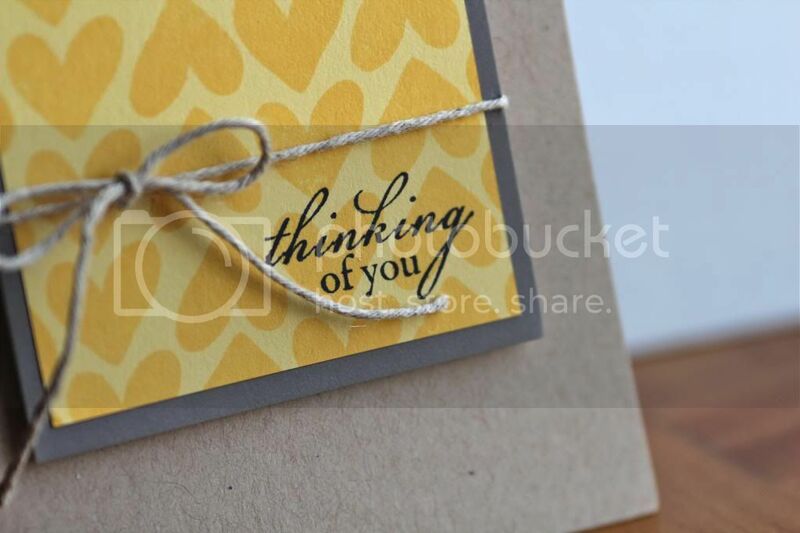 This is a SUPER simple card! 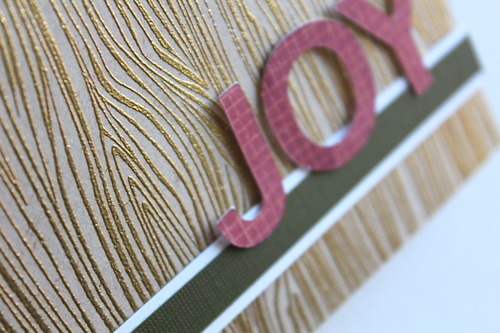 To make it I embossed gold woodgrain on the entire PTI kraft card base first. 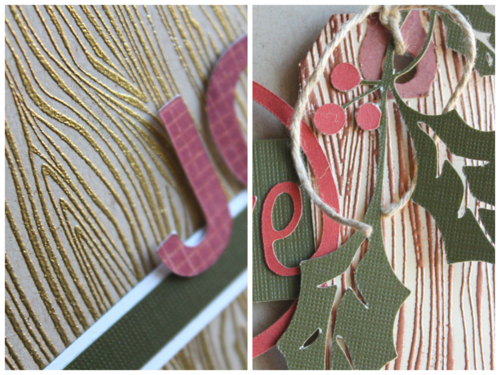 I cut and adhered pieces of solar white cardstock (also from Papertrey Ink) and green textured cardstock together and then onto the card base. 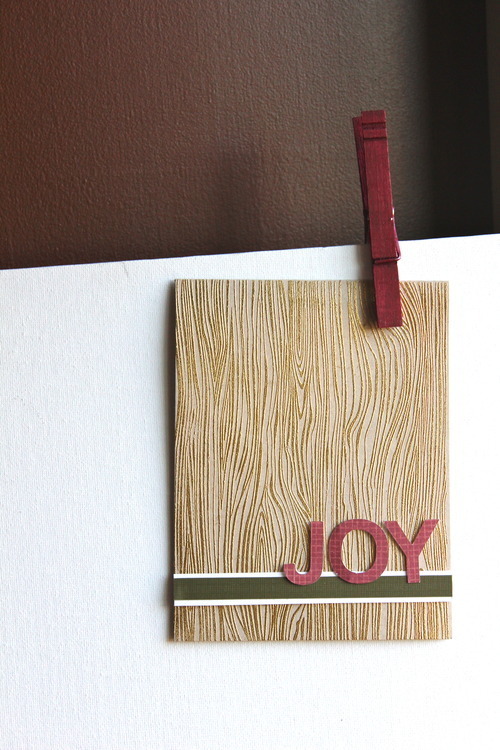 And finally, I attached the die cut “JOY” on top with dimensional adhesive. Anddddd… done! SO simple, right? Well, that’s all I have for you today! Have a wonderful week and I will see you next Tuesday! Happy creating! …and don’t forget to come back tomorrow for more information on this card as well as one more fun card I will have for you! See you then! Happy Tuesday all! This is the last week for Halloween posts and I can’t wait for Thursday! My daughter decided she wants to be a cat and she is just the cutest little cat there is! (Of course, I am a bit biased!) My son may or may not be dressing up… he is still a baby so we will see if he’s up for it 🙂 Now onto the cards! 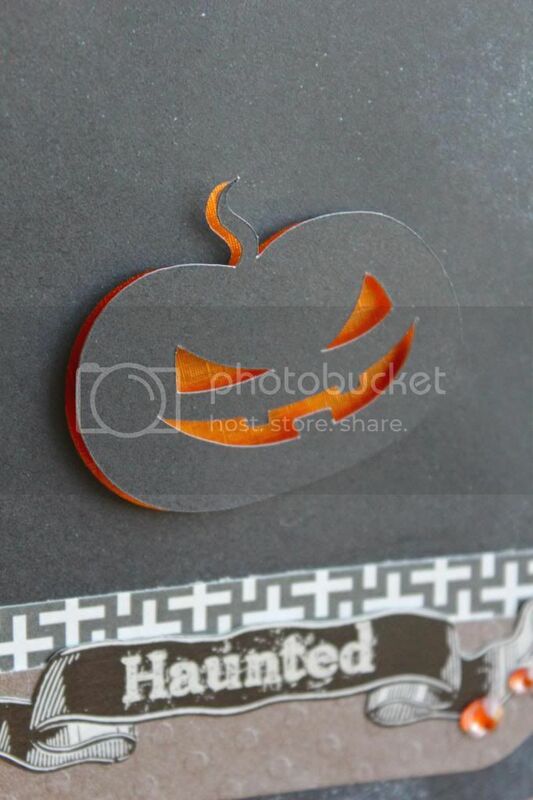 I made this card by first die cutting the pumpkin from chalkboard black paper (from one of the past Studio Calico card kits) and rounding out the corners of the negative piece. 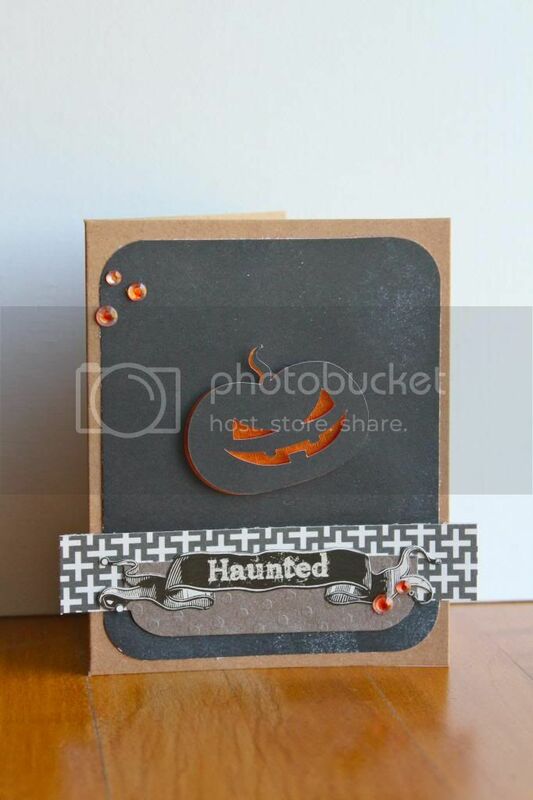 I adhered a piece of the metallic orange paper behind the black and adhered the whole thing to the card base. I attached the actual pumpkin that got cut out with dimensional adhesive and a bit off center to where it was originally cut. Next, I attached a trimmed piece of the “+” patterned paper (also from a past Studio Calico card kit) as well as a trimmed and rounded piece of gray paper. My sentiment sticker is placed on top and I finished the card off with some clear gems that I tinted orange a bit with ink. What do you think? 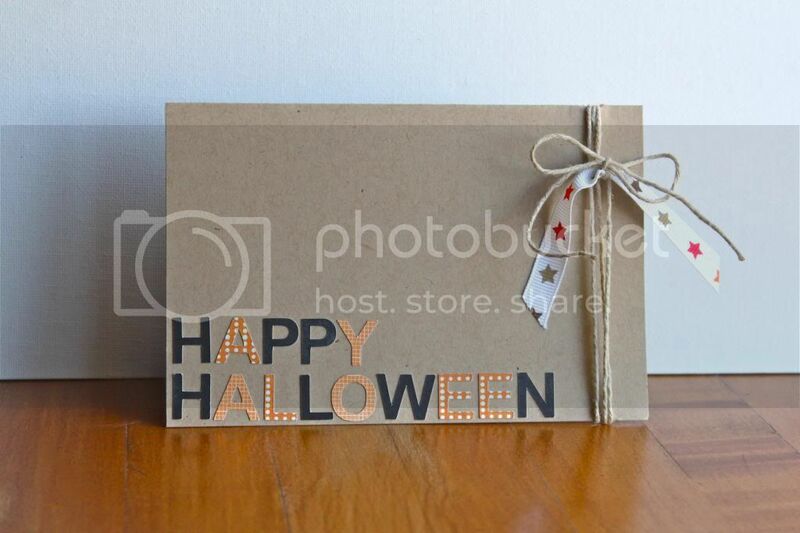 I wanted this one to be a little more cute than scary so I picked out some fun patterned papers in orange and black and die cut the letters for “Happy Halloween.” I adhered them to my kraft card base with a glue pen and then wrapped twine with a piece of star ribbon on the opposite end. That’s it! 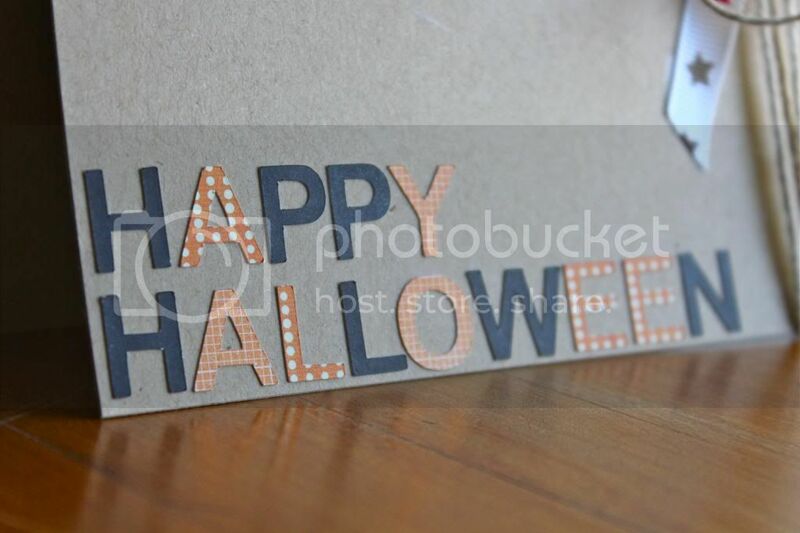 Halloween can be such a fun holiday and I hope you have been able to create some great cards, crafts, and memories this year! Have a safe night trick-or-treating!